Kadi is different than curry. The Kadi which I'm talking about today is basically yogurt based punjabi kadi, made using chickpea flour. Regular combination is with pakoras, which is absolute favorite of mine. Where as Curry is a term mainly used for any kind of dish which is gravy based and can have many versions of it, like tomato based, onion & tomato based, coconut based. To get the perfect flavors of punjabi kadi you need sour yogurt/home made dahi, even buttermilk will also do. It's perfect way to turn sour yogurt to tasty dish. So if you have 2-3 days old dahi, it's perfect for kadi or otherwise I prefer to leave it out of the fridge overnight at some warm place and next day cook it into kadi. Whisk the yogurt, add chickpea flour and all dry spices to it & whisk it to remove all the lumps. Keep it aside. Heat little oil in a heavy bottom karahi/wok. Add mustard seeds, cumin, whole red chillies, cloves and let them splutter a bit. Add garlic, ginger and sprinkle some salt on it, to prevent ginger from sticking to the bottom of the pan. Add the yogurt mixture to the pan. Add around 4 cups of water. Once the whole mixture starts to boil turn the gas to the setting( med. high works for me) where it will still boil but won't overflow. Let it cook for approximately 30 minutes or so, stirring occasionally. Add spinach and let it cook for another 20 minute or so. Also adjust the consistency of the kadi, add more water if it's getting too thick or let it boil bit more if it's too thin. Once cooked, kadi tends to get thicker keep that in mind while adjusting the consistency. Classic combo is with rice but you can always serve it with naan/ roti. If the yogurt / dahi was sour you will get the perfect sour kadi. The recipe above is missing pakoras and some whole spices in it which are normally used when punjabi pakora wali kari is made, as my kids don't like Kadi with whole lot of whole spices in it. I will post the punjabi kari with pakoras whenever I make next time, this is little litter version of that. Before I sign off this post I would like to say thanks to my blogger friends for visiting my blog everyday for last 7 days and leaving thoughts on my spinach week special. Though there are many more recipes which I cook with spinach but either they are very usual one like saag, dal palak, palak paneer or I didn't get to take the pictures. So, for now no more spinach on the blog everyday but it's surely making it's appearance on our dinner table everyday. And once in a while more recipes with spinach will make appearance on the blog too. After looking at today's post title those who don't like lauki(bottlegourd), kaddu(pumpkin) kind of vegetables, the vegetables which belong to squash family must be thinking of skipping reading this post. Two days in a row I'm posting veggies from the squash family but let me say one thing, pumpkin is something if you cook it with right spices it can be finger licking good. Like lauki pumpkin is also used for making dessert called kaddu ka halwa but as I said in my last post in my house these vegetables are strictly for savory dishes only. Today's recipe can be made without spinach, that's what I usually use to make but now with the command from His Highness regarding eating spinach everyday, I'm incorporating spinach in many dishes which I never thought will taste good with the addition of any other thing in it, but reality is we all liked it and they taste equally good or sometime even better. Me : does this pumpkin look good ? He : why ? U want to buy pumpkin.....I'm not gonna eat this. He : Is there any more??? Result : Veggie bowl is finger lick clean....end of the story, no leftovers for tomorrow. If anyone interested about what happens in my house when I make kaddu(pumpkin) in any other form please click here. Heat cooking oil in a heavy bottom pan on med. heat, add all the whole spices when aroma starts to come add garlic. After a minute or so add Onions. Once the onions are translucent add ginger & pumpkin cubes. Saute them for 7-8 minutes. Pumpkin will be kind of all glazed & shiny. Add tomatoes, green peppers & all dry spices. Now if U r not using spinach let it cook till the point when pumpkin is cooked but still holding it's shape. DON'T OVERCOOK IT otherwise pumpkin will get all mushy. Whenever it's getting too dry add couple of spoons of water at a time. 5. If you are planning to use spinach than add spinach and follow the instructions as per #4. 6. Serve it warm with freshly made roti. Note : Pumpkin is a vegetable which is sweet in taste, so we like it quite spicy, this kind of preparation gives it sweet & hot taste. Bite into the pumpkin and you feel the sweetness of it and the moment gravy mixture touches your taste buds you get that kick from the hot side of it, wanting you to eat more and more of it. Please adjust the level of heat according to your by adjusting the use of dry whole red peppers, green hot peppers & garam masala. As for other spices I'll really suggest to use them to get that aromatic hot & sweet flavor. As this dish contains fenugreek seeds in it I'm sending it to one of my favorite blogger SE of Denufood who's hosting her first blog event "Cooking with Seeds : fenugreek" brainchild of Priya. Lauki / ghiya / doodhi / bottle gourd..... no matter what ever name you call it with, it's that kind of vegetable either you like it or not. Despite having a long list of health benefits attached to it, still it has a very bad reputation, mainly considered as a vegetable to be eaten during sick time(as it's very light vegetable on your digestive system) and also favorite among older generation being healthy & soft. It's also a very versatile vegetable depending on how you want to eat it, you can use it for yogurt dips(doodhi ka raita), vegetable curries, lauki chana dal is one very famous combo, my personnel favorite is ghiya ke koftas, another famous one is doodhi ka halwa, kheer & burfi.... yes it is equally common in sweet preparations also(though I stick with savory versions only) and one latest craze among modern age Yoga Guru Baba Ramdev's followers is Lauki Juice, about which he says "It's best unknown medicine to the world". Personally I have never tasted that juice, I like to stick with soup & curries made with lauki. Now before we move to the recipe, if you don't like lauki try to add little sour(I use x'tra tomatoes) & chilli flavors to it, that worked for him when I made him eat lauki for the first time almost a decade back. But now he eats it any way I prepare..... as long it's in a savory dish & strictly no sweets & juice out of it for him. Boil Nutri nuggets in salted water for 5 minutes, rinse, drain squeeze. Heat oil in a heavy bottom karahi/Wok on med. gas. Add urad & chana dal to it. Once dal gets little brown, add hing, cumin. Next add ginger garlic and after few seconds add chopped onions. Cook them till they become translucent. Add all the dry spices & salt. Next add chopped up tomatoes. After around 3-4 minutes add lauki to the pan, mix everything together, let it saute for 3-4 minutes or so than add 1/2 cup of water, cover & cook. After around 10 minute or so add spinach & nutri nuggets to it & let the whole thing cook together for another 10 minute or so. Depending upon how fresh and soft raw lauki is cooking time will vary anywhere from 20 minutes to 30-35 minutes. Don't let the lauki get too mushy. Once done squeeze some lime juice before serving it with roti / naan / parantha or dosa. This is again one of the easy All-in-One kind of curry. Got vegetables, greens & soy protein(nutri nuggets) everything in one dish. Enjoy it. Note : Occasionally(got twice in last ten years) lauki can be bitter also, so I usually eat a piece or two of raw lauki(before cooking) to make sure that it's fresh and not the bitter one , but if that's the case don't use the vegetable just throw it, as it can be harmful on your stomach. Palak Murg is one of the famous dish from North India. Again there are many recipes for it, but the one I'm going to write down today is..... I can say authentic to my family, as it's not using spinach puree & also lot of onion & tomatoes are used in this one. Today's recipe is very simple in two ways : first there are no measurements, no particular recipe to follow and second it's cooked by him( reason for no measurements & no recipe). In regular day to day cooking we don't do measurements but when it comes to cooking by him, I'm never sure what will be the final dish but one thing is sure, no matter what he puts in the dish or how it looks like the taste is surely going to be superb. As I said I don't have exact measurements for the ingredients but I'm still gonna write down the basic ingredients & steps, it can be easily adjusted to your taste. Mix everything in the marinade list in a big bowl & add chicken to it, coat it with the mixture. Keep it in the fridge for whatever time U have on hand (for an hour to maximum overnight, around 12 hrs. or so). Bring it out of the fridge, at least half an hour before cooking. Heat oil in a big wide pan/karahi. Splutter whole spices in it. Add chopped onions. Saute them well. Once the onions are done add tomato paste, chopped tomatoes, green hot peppers. Let the mixture cook. Add chicken masala powder & marinated chicken alongwith all the marinade. Once the chicken is 90% done add chopped spinach. If at any point it gets dry add some water. Cook till chicken is completely done. Sprinkle some garam masala on top of it. Serve it with naan / roti / rice. Note : If using store bought chicken masala, adjust the salt in the dish, as many a times those spice packets have salt in it. In a heavy bottom pan heat little ghee/oil(1 Tblsp.). Add cumin, cinnamon stick, cloves & dry whole red chillies. Add drained rice & gently stir them so that they get the coating of oil. Add all the dry spices, stir. Add spinach, carrots & bhalle/vadas(if using). Do not soak the bhalle first in water. Add 2 cups of water. Cover & cook till the rice are done. * Note : Use of ghee will make it more aromatic. Addition of bhalle makes this dish complete meal as it provides the protein. Whenever I make bhalle for dahi-bhalle I usually make few additional small bite size bhallas also, and freeze them which come handy in dishes like this. Variations : Instead of bhalle to get the dose of protein one can use nutri soy chunks, chicken or paneer cubes(Indian cheese). But in case of paneer add it once the pulav is cooked. What U do : Whisk the yoghurt & add rest of the ingredients. Serve it as a side dish for any kind of pulav or in this case with spinach pulav. Sun dried dumplings of yellow lentils that's the best English translation I can do for wadi(sun dried dumplings) made with moong Dal(yellow lentils). Usually when someone talk about wadi the first thing or I should say the first place associated with wadi that comes into mind is Amritsar(Punjab). Famous for the most sacred Sikh Shrine "Golden Temple" and at the same time famous for it's delicious, rich food and Amritsari papad and wadiyan. Wadis that come from Amritsar are mainly made with urad dal & whole spices, very spicy and they are big in size also(about the size of fist). But the wadis I used here in this recipe are from Rajasthan, not at all spicy small in size, looks very much like nutrella nuggets also known as mangodis. I ate them first time only after my marriage when my MIL prepared it with some different combo, I loved it form the day one. Heat oil(around 2 spoon) in a big pan or karahi(wok). Add hing to it after few seconds add cumin & dry red chillies. When cumin starts to splutter, add garlic followed by ginger, sprinkle some salt so that ginger release it's juices which will prevent ginger from sticking to the pan. Add onions & let them cook till they become translucent. Add all the dry spices, saute for a minute or so than add tomatoes. After around 5 minute or so add wadis to the pan. Mix them so all the wadis get coated with the onion tomato mixture. After 5 minute or so add 1 cup of water. Cover it & let it cook for around 10 minute or so. These wadis absorb a lot of water as they are not fried. So keep an eye just in case if it gets too dry add some more liquid. Add chopped up spinach, green chillies & let the whole thing cook on med. heat for about another 10 minute or so. It's a thick kind of gravy dish, adjust the amount of liquid as per your taste. Serve it with roti/phulka/prantha, it's one wholesome dish with protein pack wadis & healthy greens cooked together. Note : Sometime these wadis can be really tough & can take little longer to cook. My MIL prefer to cook them in pressure cooker while making it in gravies. I sometime when in hurry, cook them halfway in microwave, covered in water in big bowl for roughly 5-7 minute & finish cooking them with rest of the gravy & spinach for around 10 min. or so. But again timings are only guidelines as sometime two packets bought together can also consume different time to cook. Another important thing to remember is to keep these wadis in the fridge, in fact I keep all type of wadis in fridge. Specially moong dal wadis go stale easily, keeping them in fridge assure freshness for long time. To me pasta is very versatile. It can be prepared as a complete meal in itself or as a side dish or even as a salad. Another good thing about pasta is being a one pot meal it's hit at my place. I love pasta so much that I can even eat it for breakfast, lunch, dinner, afternoon snack or even late night snack. I don't need lot of cheese in my pasta, but yes lots of veggies are kind of must. Pasta is regular at my place but every time with little twist depending upon what veggies I have. This one with spinach is one of my favorite. Now talking of spinach, sometime in the beginning of this month DH decided that he want spinach for at least one meal everyday. In my household we cook most of the veggies & greens but when you want to eat spinach everyday you need to think out of the box, regular palak paneer, saag they are good no doubt but I'm sure no one can eat it day after day and most importantly for eating one good thing you can not give up other good things. So, for next 7 days I will try to post one recipe with spinach each day, just to give some idea that how easy it can be to include spinach in your everyday diet, you don't have to be Popeye and eat your spinach direct from the can you can make it more tasty & visual treat for your eyes before you eat that healthy stuff. Excellent source of vitamin A, C & folate. Flavonoid compounds in spinach function as antioxidants and as anti-cancer agents. It's an excellent source of bone-building nutrients including calcium and magnesium. The anti-inflammatory nutrients in spinach can also help with conditions in which inflammation plays a role. For example, asthma, osteoarthritis, osteoporosis and rheumatoid arthritis are all conditions that involve inflammation. Cooked spinach is an excellent source of Iron. Boil pasta as per the packet direction, Boil it for a minute or two less than the specified time as we gonna finish cooking it in the sauce.Reserve the pasta water. In the mean time while pasta is boiling, clean & roughly chop the mushrooms. Heat oil in a big pan, saute garlic & mushrooms in it. If you chop the mushrooms thin it should not take more than 5 minutes. Once done sprinkle some salt & black pepper. Add milk to it & let it boil, simmer cook for another 2-3 minutes. Cool little bit, take it out & puree it. That's the creamy sauce for the pasta. In the same pan pour little pasta water & add chopped up spinach to it, let it cook for few minutes(roughly 4-5 minutes). Don't add any salt to this as we are using pasta water which is salty. Once spinach looks like cooked add boiled pasta(drained), cooked chicken & mushroom sauce to it. Sprinkle some red chilli flakes. If it's little dry add some of the pasta water. Let everything cook together for a minute or two. If you like sprinkle some Parmesan or any other cheese of your choice on top of it. Note : I puree the mushrooms into sauce as this is one thing which my DD doesn't eat no matter what recipe they are in, so disguising is the only option I'm left with. You can leave it chunky as per your taste. Also for the vegetarian version, chicken can be left out & may be another packet of mushrooms can be added sliced & sauteed for the dose of extra protein. Step 1 : Making the dough : Mix everything except water in a big wide bowl. Slowly add little water at a time & knead it to soft dough. Cover & let it rest at the room temperature & prepare the filling in the mean time. In a bowl toss chicken strips with little oil(1 tsp. ) 1/2 tsp. of each salt & black pepper. Once the chicken is done take it out & in the same pan add another spoon or so of oil & add garlic. After few seconds add onions, green bell pepper & red bell pepper. Saute them for couple of minutes. Do not overcook them. Add all spices & green chillies if using also add cooked chicken to it & mix everything. If it looks too dry add little water or chicken stock. Cover & let it cook for 2-3 minutes. Turn the gas off. Take a little dough & roll it into your hand & make a smooth ball of it. Using rolling pin roll it into around 10" disc. Cook it on both sides on a hot griddle. For detail procedure you can check this post about making Indian flat bread called roti, as the procedure is very much same. Repeat for rest of the dough. Lay one cooked tortilla on plate. Spread around 2 Tblsp. of filling in the center. Top it with salad of your choice. Spread some sour cream or thick plain yogurt. Now roll it : pull up and tuck the bottom, wrap the right side in and then the left, tightly. 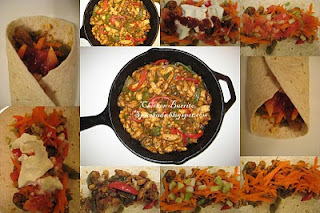 Click here for detail step by step pictures on how to roll a burrito. Step 5 :Enjoy your burritos while they are still warm. Add chicken to the pan in a single layer. Once the chicken touch the surface of the pan DO NOT TOUCH IT for couple of minutes or so. Stay there, watch it & you'll know when to turn it. Because once the bottom side is cooked, it'll turn to little brown(no more pink) and when you try to turn it, it won't stick to the pan means it's ready to be turned. If it sticks then wait. Why am I emphasizing on this so much because for long time I myself was not sure that this will work I always feared that chicken gonna stick to the pan so I always used my non stick pan for this purpose but then again we are not big fan of non-stick pots & pans here. So then I decided to use my cast iron pan for this purpose as it's quite heavy & since that time non-stick pan is in my kitchen but we don't use it anymore. Make sure filling is not watery otherwise end result will be soggy. Don't fill it too much, or it will be little too difficult to roll. Paprika, oregano & cumin are the main flavors of this dish, do not compromise on those. There is no fixed way to fill your burrito, go as per your taste. I haven't used any red beans which are commonly used but instead I had some boiled chickpeas in the fridge so I added those to the filling too. Mushrooms are good substitute for chicken to make it vegetarian. Rice can also be added while filling the burritos . 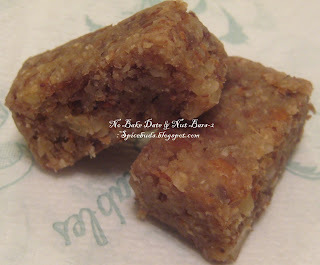 Today's post is all about trying recipes from the fellow bloggers. Almost a decade back when I started to have adventures in my kitchen, Bawarchi.com was the main or I should say only place where I would go searching for the Indian recipes. But many a times even I liked the recipes but because of lack of photos I never tried those. I always love reading cookbooks also with food photos. Fast forward o 2009, I discovered food blogs while looking for some recipes and instantly loved that how everything is given with photos. Result is my list of bookmark recipes, sometime I feel, to find a bookmarked recipe I need some sort of search program....I can't help bookmarking, because the details and pictures in the recipe make me go "try this one...try this one". So, to solve that problem I try to make the recipe same day I discover it(provided I have everything on hand plus time to make it). 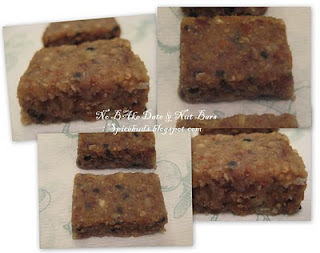 My first trial was Ragi Roti and in the past couple of weeks I tried 2 more recipes : No Sugar Nuts Fudge from Creative Saga and Savory Semolina Cake from Red Chillies, they have also adapted these recipes from other food blogs. Now for the recipes I mainly followed the actual recipes but with some changes according to my taste & availability of ingredients.So for actual recipes please check the respective blogs as I'm going to mention only the changes I made. Actual recipe doesn't ask to soak the dates but I did soaked them in 2 Tblsp. of warm milk as that made it easy to puree them. But that also add little extra moisture, so for that add either more oats or nuts. But I added sesame seeds & wheat germ which balanced it. Also, I kept only few pieces outside & rest in the fridge as I've used milk in it. I made two versions, first version was for kids so I used almond meal instead of coarsely grind almonds & I didn't used any walnuts in this. Added 2 Tblsp. of Wheat germ + 1 Tblsp. of instant oats. Second version : Coarsely grind almond & walnuts. I also added around 1 Tblsp. each brown & black toasted sesame seeds and 1 Tblsp. of wheat germ. NOTE : a) If you are new to black sesame seeds, it's better to use them in combination with regular sesame seeds you use, as the flavor is really strong, but they have more calcium, for more details check here. b) Wheat germ is a concentrated source of several essential nutrients & essential fatty acids. Which is naturally found in whole wheat flour. I use it in my baking & cooking whenever I'm using any other flour than whole wheat flour. I don't remember the actual source from where I read it but it said it should be used sparingly as it is concentrated form of nutrients and it also need to be stored in fridge as it can easily become rancid if not stored properly. baked them as muffin in regular muffin tin for 22 minutes at 375 degree F.
Loved the taste of Upma & the ease of baking it in the evening & having it for weekday breakfast next morning. 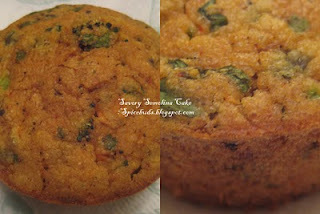 Thanks to Sowmya & Supriya for sharing these recipes. I feel this is the best way to celebrate my 50th post in this blog world by saying thanks to my blogger friends & enjoying some of their recipes. This is not something I make regularly, in fact I made this dish this way for the first time but I'm sure I'm gonna make it quite often now. Though I named it Hariyali(greenery) fish, but the color of the dish is not green because the greens are not pureed & also because of all the other ingredients that goes in. Plan was to make regular fish curry but when I opened the cooler box saw two bunches of fenugreek(methi) leaves, needed to be cleaned but as I was cleaning, my mind was planning something else. I must say inspiration behind these kind of dishes is Mr. HE, as he keep saying put fish & chicken in everything you cook and which is totally not me. I do use dry methi leaves(kasuri methi) in my fish curries but cooking with fresh ones is little different as fenugreek has little bitter taste, though in my family everybody enjoys it but when mixing it with fish I didn't wanted it to overpower the flavors of fish, so I made it little extra spicy and used little extra onion & tomatoes. The final results were so good that I'm sure I'm gonna make it regularly now. oil for cooking around 2-3 Tblsp. Sprinkle juice of lime on the fish and rub salt, 1 tsp. turmeric, 1 tsp. of paprika on the fish. Cover and keep it aside. Take a wok/Karahi, heat 2 Tblsp. of oil. Add mustard seeds when splutter add garlic, when aroma starts to come add ginger & sprinkle a pinch of salt on to it, that will help ginger release it's juices hence prevent it from sticking to the bottom of the pan as we are not using a lot of oil. Now add chopped onions, pinch of salt, stir, saute them till they become translucent, add tomato paste & tomato puree. Cook it for 5 minutes or so. Add green chillies, salt, 1 tsp. turmeric, coriander powder, chilli powder, 1 tsp. paprika.Mix it. Add chopped methi(fenugreek) leaves to it. Cook it for about 15 minutes or so on medium heat, stirring occasionally. 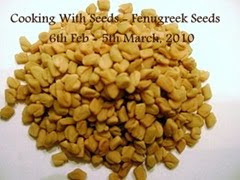 Below is the picture of fenugreek cooked at this stage. While leaves are being cooked, heat an iron griddle or a non-stick pan add 1 Tblsp. of oil & saute the fish on both sides. Saute it till it's cooked half way, as rest of the cooking will be finished in the sauce. For salmon with skin on I usually cook for around 2-3 minutes on each side, depending upon it's thickness. Keep it aside. Beat yogurt/dahi add it to the veggie mix, let it cook for few minutes & it will start leaving oil on the sides of the wok/karahi/. Add around 2 cups of water, cover & let it come to boil. Add less or more water according to the thickness of sauce/gravy required. I made thick kind of gravy (not runny kind) to be served with rice. Once the water starts to boil add sauteed fish, give it a gentle swirl & let it cook for another 5 minutes or so, till the fish gets fully cooked. I served it with rice but I'm sure will taste equally good if served with roti(Indian flat bread). 1) Due to its estrogen-like properties, fenugreek has been found to help relieve the symptoms of menopause and PMS. 2) In India and China it has also been used to treat arthritis, asthma, bronchitis, improve digestion, maintain a healthy metabolism, cure skin problems (wounds, rashes and boils), treat sore throat, and cure acid reflux. 3) Fenugreek helps lower blood glucose and cholesterol levels. 4) Fenugreek is also being studied for its cardiovascular benefits. 5) Very beneficial to aid milk production in lactating mothers. As one of the main ingredient is fenugreelk leaves, I'm sending this dish to Yasmeen's Health Nut Challenge : 4 - Bitter Better Health.